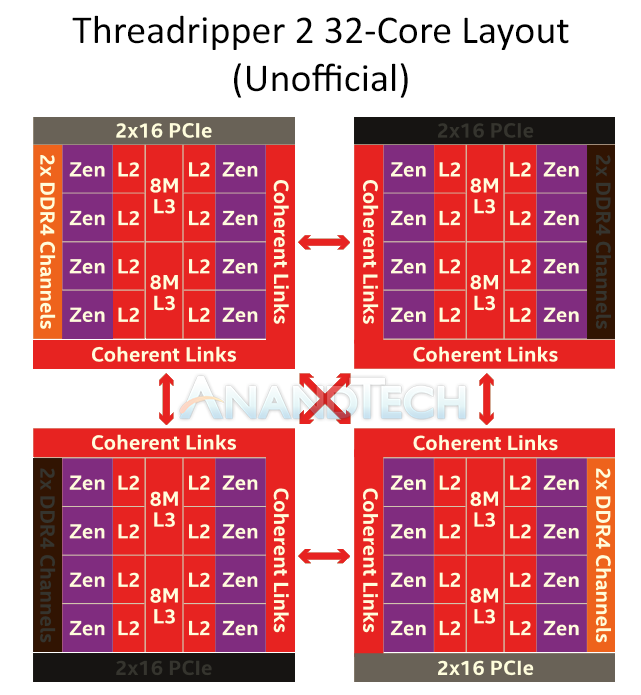 One of the surprises from AMD’s first year of the newest x86 Zen architecture was the launch of the Threadripper platform. Despite the mainstream Ryzen processors already taking a devastating stab into the high-end desktop market, AMD’s Threadripper offered more cores at a workstation-friendly price. 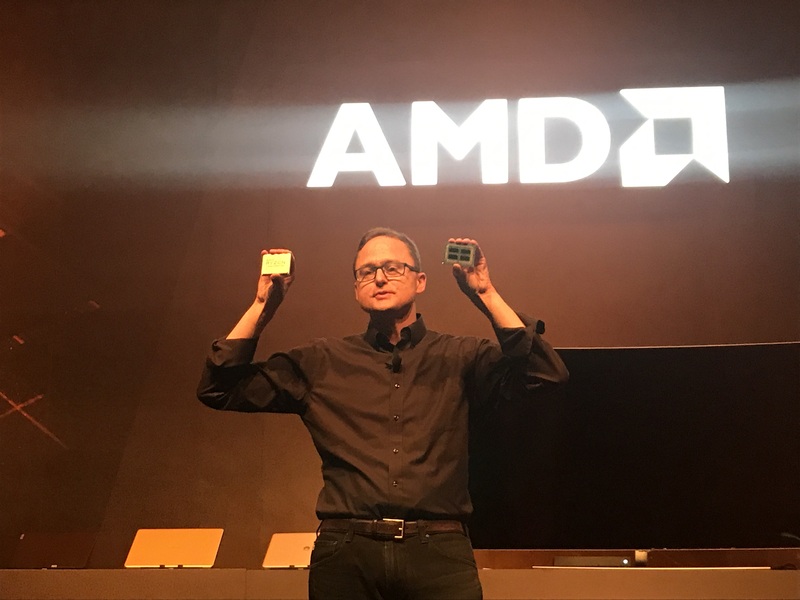 For 2018, the next generation is going to be using AMD’s updated 12nm Zeppelin dies, as well as including a few new tweaks into the system including better boost and faster caches. This article is still a work in progress, and will be updated as more news comes in. AMD’s Zeppelin silicon has 8 cores, and the first generation Threadripper uses two of them to get to the top-SKU of 16-cores. Inside the CPU however, there are four pieces of silicon: two active and two inactive. 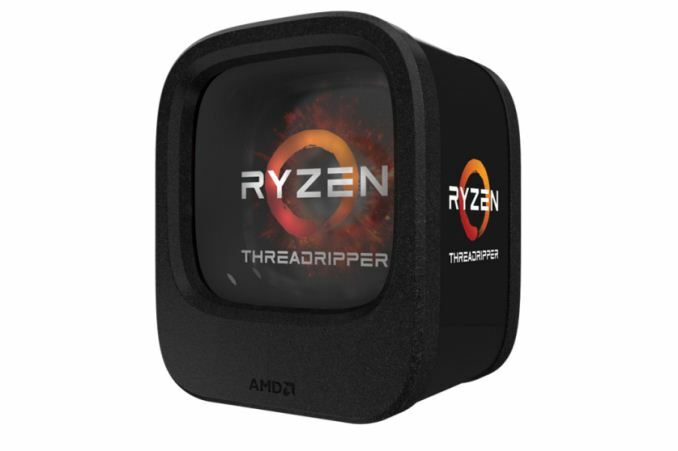 For this second generation of Threadripper, called Threadripper 2 or the Threadripper 2000-series, AMD is going to make these inactive dies into active ones, and substantially increase the core count for the high-end desktop and workstation user. This technically adds latency to the platform, however AMD is of the impression that for all but the most memory bound tasks, this should not be an issue (usually it is suggested to just go buy an EPYC for those workloads). While it does put more pressure on the internal Infinity Fabric, AMD ultimately designed Infinity Fabric for scalable scenarios like this between different silicon with different levels of cache and memory access. 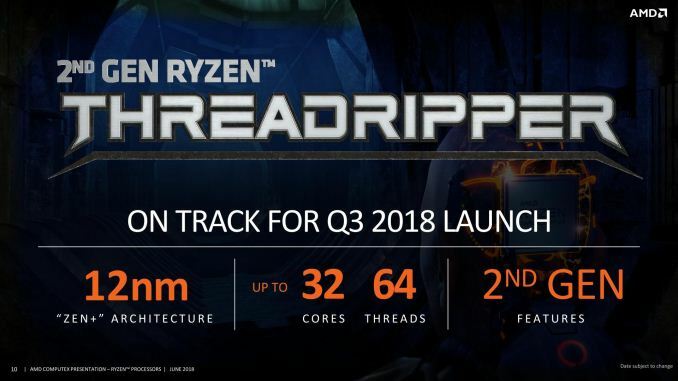 Update: AMD has just published a full copy of their slide deck for the Threadripper 2 presentation. In it are a few interesting factoids. 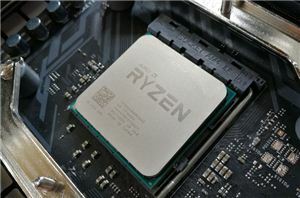 Both the 24-core and 32-core sample CPUs are clocked at 3.0GHz base and 3.4GHz all-core turbo, with the latter being a work-in-progress according to the company. The 32-core system was equipped with DDR4-3200 memory. This is notable because the Ryzen processors based on the same 12nm Zeppelin dies officially max out at DDR4-2933. The codename for the processor family is listed as "Colfax". This is the first we've heard this codename from AMD. Also announced at the presentation is the state of play of motherboards. 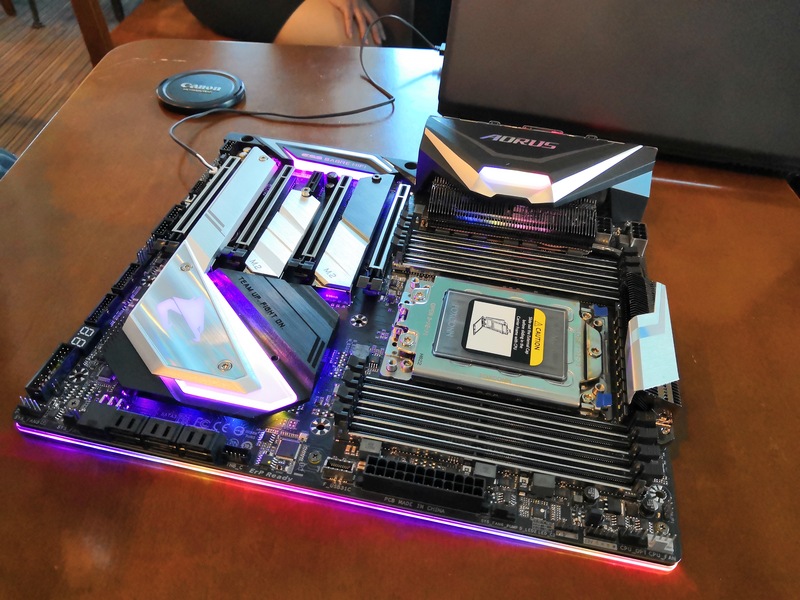 According to the motherboard vendors These new Threadripper 2000-series processors will have a peak TDP rating of 250W, which is much higher than 180W we saw on the 1950X. We have been told by partners that the 250W rating is actually conservative, and users should expect lower power consumption in most scenarios. Nonetheless, it was stated by several motherboard vendors that some of the current X399 motherboards on the market might struggle with power delivery to the new parts, and so we are likely to see a motherboard refresh. That is not saying that the current X399 offerings will not work, however they might not offer overclocking to the level that users might expect. 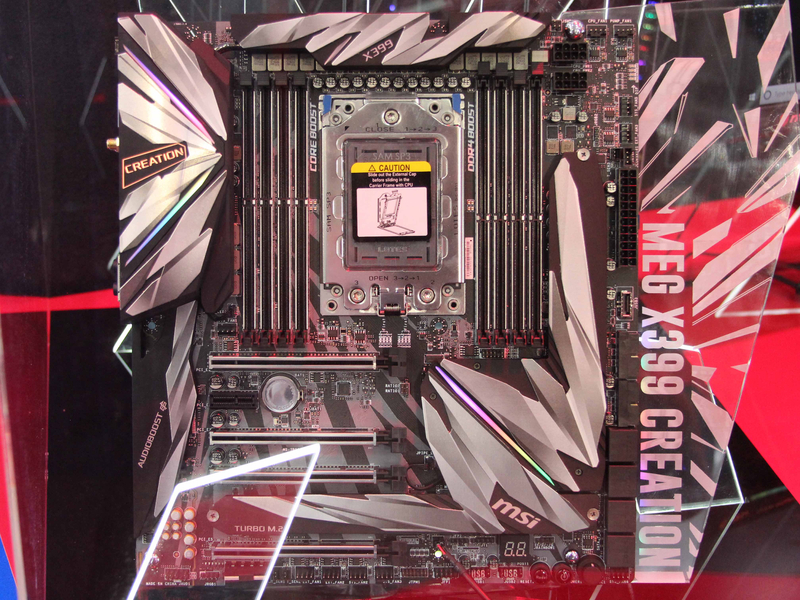 At Computex there are new X399 refresh motherboards being demonstrated by a few companies, and we will report on them in due course. 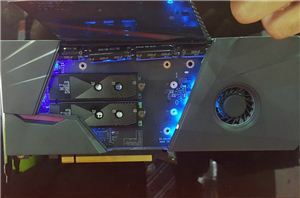 Other specifications are expected to match the previous generation, such as PCIe lane counts, despite the newly active dies. The launch for these new processors, according to our moles is in early August. This aligns with what AMD stated at the beginning of the year at CES, and is almost a year from the original Threadripper launch. Pricing on the processors is set to be revealed either today or closer to the launch time. We will update this piece as more information comes in. 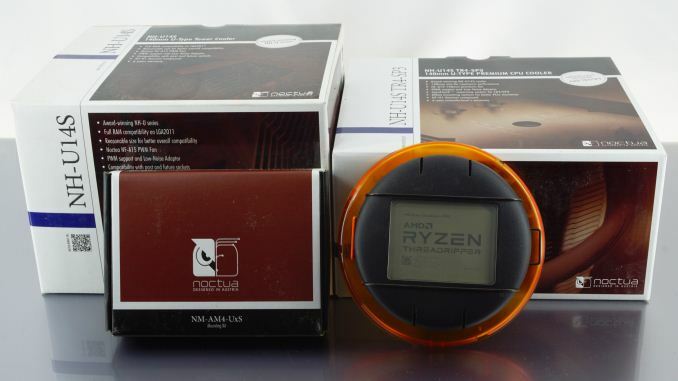 It will be interesting if AMD is going to go through the ‘unboxing’ embargo this time around, or just jump straight to full performance reviews. 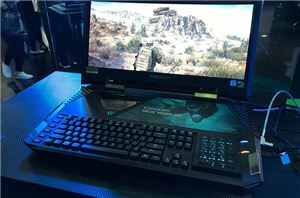 As always, come to AnandTech for the full story. Honestly though, what do you expect? Look at 5GHz quad cores and the heat they generate, then extrapolate that to 28 cores. Intel is getting rather desperate to stay on top, they're overclocking their own CPUs beyond safe limits to beat AMD. Sounds rather like the Coppermine @ 1.13GHz fiasco. They released the CPU then had to recall it, replace a huge number of them and release it again. I've never understood it myself. Subjectively I'm a bit of an AMD fan. Objectively, even as badass as the Zen is, I'm still considering Intel for my next build for a few specific reasons.